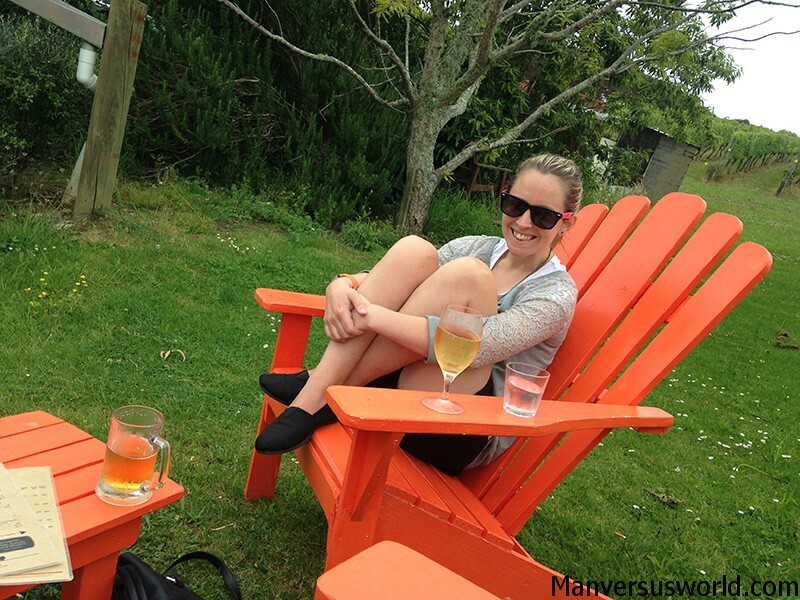 If this was a list of the best Waiheke Island winos, I’m sure I would make the cut. As such, it makes me a reliable person to tell you about the best wineries on this gorgeous little island in Auckland’s Hauraki Gulf. However, while I do know an excellent winery when I see one – awesome ambience, glorious views, amazing service, great food, reasonable prices, etc – I’m hardly the world’s foremost expert when it comes to wine. I know what I like, let’s put it that way – but I’m not 100 percent sure that in a blind taste test I’d be able to tell a $100 bottle of pinot noir from a $20 one. Wine snobs should definitely keep that in mind while they read this blog post. We’ll start with one of the best-known Waiheke Island wineries: Cable Bay Vineyards, at 12 Nick Johnstone Drive in Oneroa. 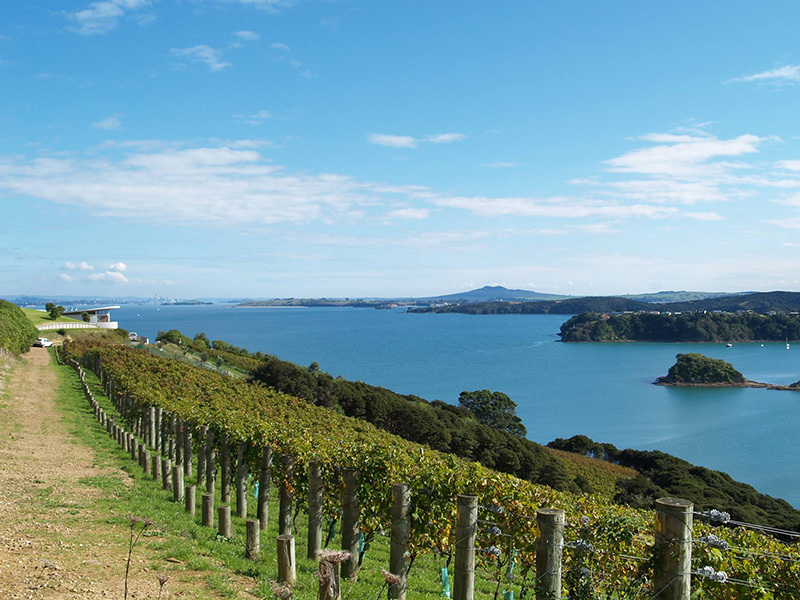 Like many of the wineries and vineyards on this list, Cable Bay boasts spectacular views over Auckland and the Hauraki Gulf. It’s the perfect setting for a boozy lunch or a long afternoon session with your friends, blissfully knocking back glasses of wine on beanbag chairs in the sun. Cable Bay Vineyards is a popular wedding venue on Waiheke Island, which could be rather inconvenient if you aren’t invited and you were planning to visit the winery for some tastings or a meal on The Verandah – its fine dining restaurant. Make sure you phone ahead to see that it’s open. 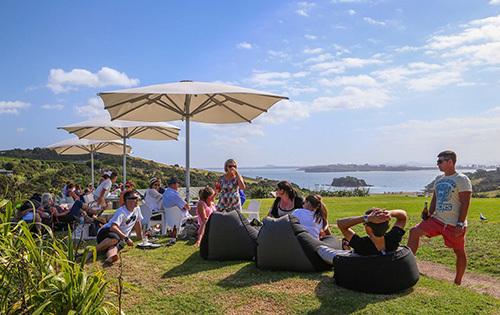 Another popular vineyard and restaurant on Waiheke Island, Mudbrick’s dazzling views, garden setting and delicious wines make it a very popular place to whittle away an afternoon. 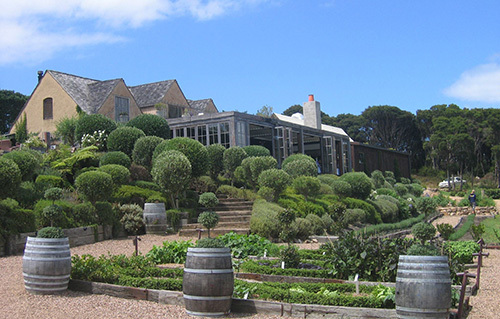 I haven’t eaten at the Mudbrick restaurant yet, but Mrs Man vs World has and she says it’s good. However, I can thoroughly recommend you sample the vineyard’s produce in its “Cellar Door” tasting room, where a standard tasting of five wines costs $10 per person or $15 for the premium wines. Not bad. 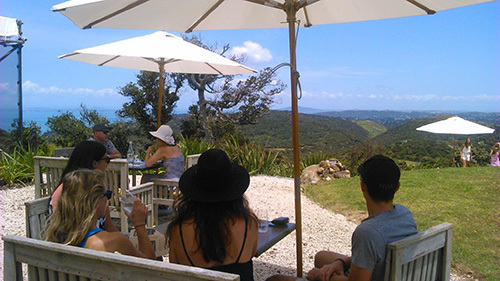 Meanwhile, visitors should take a walk through the grounds behind Mudbrick Vineyard and up the hill, where you can enjoy spectacular 360-degree views over the entire island. Up a steep driveway at 80 Onetangi Road you’ll find Stonyridge, a great vineyard and cafe that’s nestled in amongst a valley of olive trees. It’s got a large deck with comfortable sofas and loungers. Stonyridge specialises in top-quality cabernet blends which all get top marks from me, while Mrs Man vs World can also recommend its “Fallen Angel” rose and dessert wines, if you’re that way inclined. Stonyridge has wine tastings every day of the week until 5pm. 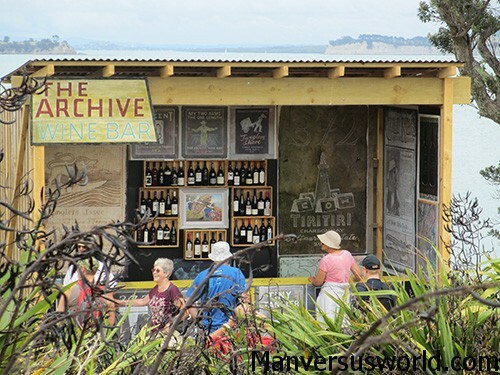 However, it’s another popular wedding venue on Waiheke Island, so it might pay to phone ahead to check that it’s open. If it isn’t, Wild On Waiheke (see further down the list) is just next door. On a recent trip to Waiheke Island for my 30th birthday, we hired a car and drove around the island. One of our first stops was the Man O’ War winery in charming Man O’ War Bay. 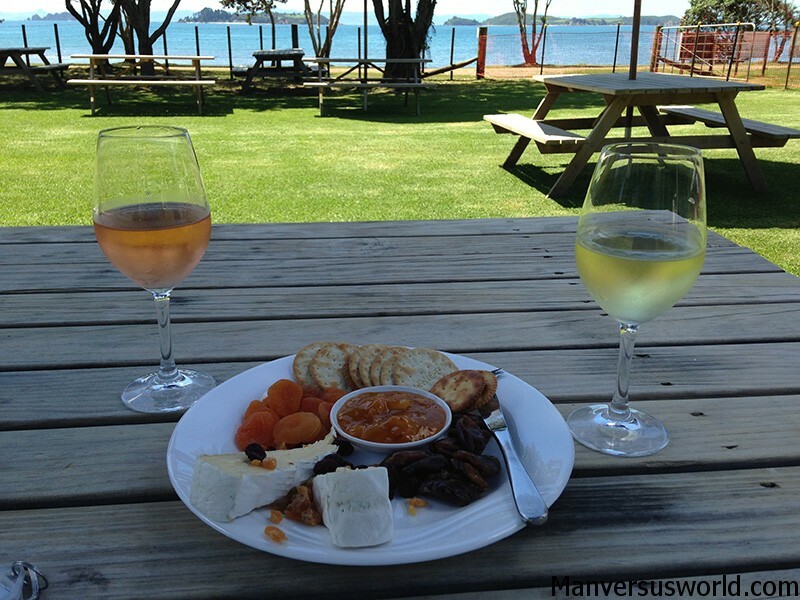 Man O’ War is more isolated than other wineries on Waiheke Island, but it’s well worth the trip over to the eastern end of the island. The staff there were very nice, and the antipasto platter we enjoyed at one of the winery’s picnic tables with a glass of rose was nicer still. We enjoyed a couple of free tastings before we settled on which wines we’d like to enjoy in the sun, and we even played some petanque on the lawn. Sunsets at Te Whau Vineyard on Waiheke Island can be stunning, particularly with a glass of the winery’s merlot, cabernet sauvignon or malbec. The views from Te Whau are just outrageous (in a good way, obviously). 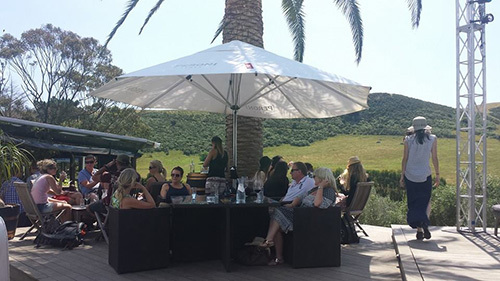 As is the case with all good Waiheke Island vineyards, you should try to make reservations ahead of time if you can – especially if you’d like to eat at Te Whau’s fine dining restaurant, which is located on the top level of the winery. During the summer, Te Whau is open seven days per week for lunch and wine tasting; it’s only open for dinner from Thursday to Saturday. Batch Winery is Waiheke Island’s highest vineyard, and from its peak you can enjoy breathtaking views over the Hauraki Gulf and Auckland. These views, of course, are best enjoyed with a glass or two of the local produce. Batch Winery seems to specialise in bubbles. While sweet, Batch’s sparkling rose and sparkling Riesling went down a treat when I was celebrating my birthday recently. Although to be perfectly honest with you, the winery could serve me lukewarm wine from out of a box and it wouldn’t diminish from this winery’s lovely setting. Apparently there are several nature walks near Batch Winery on Waiheke Island, so it might be a good idea to follow your walk with a glass of wine here afterwards. You can find Batch at 129 Carsons Road. Probably the most family friendly place on this list is Wild on Waiheke, which, to my mind, isn’t so much a winery as it is a destination. You see Wild on Waiheke does produce wine, but it’s also a brewery, cafe, archery range and place to go claybird shooting with a laser rifle. It has a playground and sandpit for the kids, and even dogs are welcome here. From its cafe menu you can order pizzas, burgers and chips. Wild on Waiheke is unpretentious and unsophisticated – but that’s definitely not a bad thing. It’s the best winery to visit if you’re either keeping it casual or you want to get a little bit rowdy with a large group of friends. How? Ferries run frequently from the Auckland waterfront or, even better, sail to Waiheke Island. I have been doing a lot of research on wineries in the area and i have read about many of them. They all sound amazing! I still can’t decide which one to visit because unfortunately I think I’ll only have time for one. 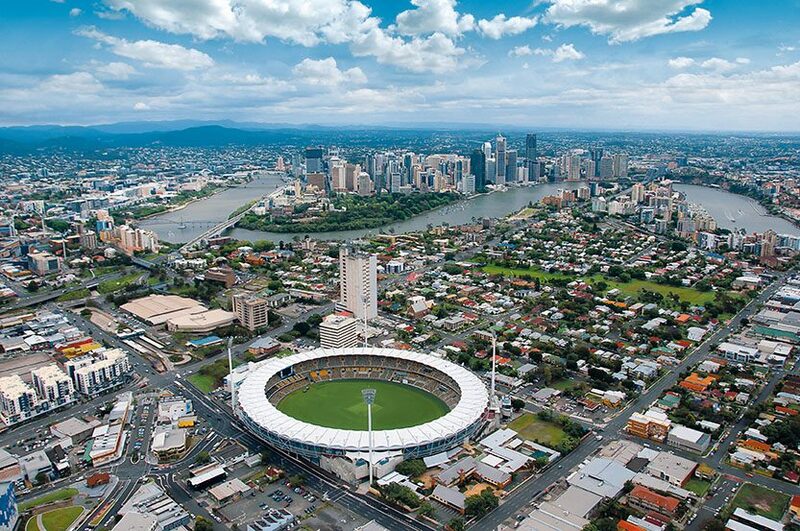 I think my favorite would be Te Whau, that view is incredible! All are beautiful shots Simon! I imagine enjoying a glass of vino while lazing in paradise is about as good as it gets. Heck no need to imagine; you did a fine job sharing the dream with us 😉 Thanks!